I hear you screaming, this is thread for the repair section, not metrology! Yes, yes, but hear me out on evil plan to capture the world first. To my big surprise, my EEVBlog HP3458A repair log thread is the most popular thread in Repair section by far with 75K views after a year. Not expected result covering DMM which cost 10 grand. Meter I had covered in there I've got little over a year ago, September 15, 2015. Since the successful repair after January 2016 unit was in 24/7 daily operation and use, logging my voltage/resistance standards, other instruments, doing current measurements, and very little bit of AC measurements with GPIB + Raspberry Pi. I'm happy with it and it simplified volt-nuttery by a lot, thanks to it's great ACAL feature and low-noise and super linear ADC. If someone serious about metrology and volt-nuttery like we call it here, I'd strongly suggest to skip all that middle-way solution meters like 3446x/70,K7510 and similar and just go straight to 3458A. Nothing can beat calibration from single 10V and 10K reference Given that, it's not everyday generic use meter either, so it should be tied and used over GPIB, really. Alright, cut the talk. While I have now good working 3458 with great help and support from volt-nuts community, I wanted even more and to tinker with it's circuits and design to understand analog better. However to me it was not worth the risk to solder stuff inside the working unit. Because if you try to fix something which is working - it will eventually break. No exceptions from this rule in engineering world. So there was the only solution from this point. YES, get the SECOND unit for all the wonderful and magical experiments I wanted to try. But buying one of those eBay 3000$ boxes is still over my homelab budget, and I wouldn't like the idea of destroying good unit, even for sake of science, like those tarded youtube videos... We need better plan. Which is - get one of those zombie-dead-rusty 3458's which do popup sometimes for less money. Few weeks ago, one of such happened to be listed, and it was a love from the first sight. No, I actually lied, I saw the unit from seller and considered 999$ too high for a box without digital A5 CPU board and busted case. But seller sold for less, so here we are. Ouch. How these expensive instruments end up in state like this? 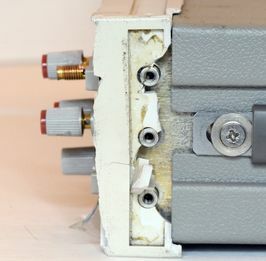 Front panel is literally torn apart... And if you think those damaged binding posts are no big deal to replace, Keysight does not agree with you, with 270$ USD price tag on that 6-post therminal block. I can see VFD in there though I was sure it's 100% shattered, as it was looking that meter had a drop on it's face. Multiple times. Attempted to remove front panel plastic..
Every single latch and notch is busted..
VFD glass seem to be good, no vacuum leak. Will see if FP board still functional. Pleasant surprise, given the condition of front face. Rear is in much better shape. Even terminal block is fine. MY-serial means unit was assembled in Malaysia, and more recent than most of 2823Axxxx boxes. No 001,002 options, but who cares anyway. 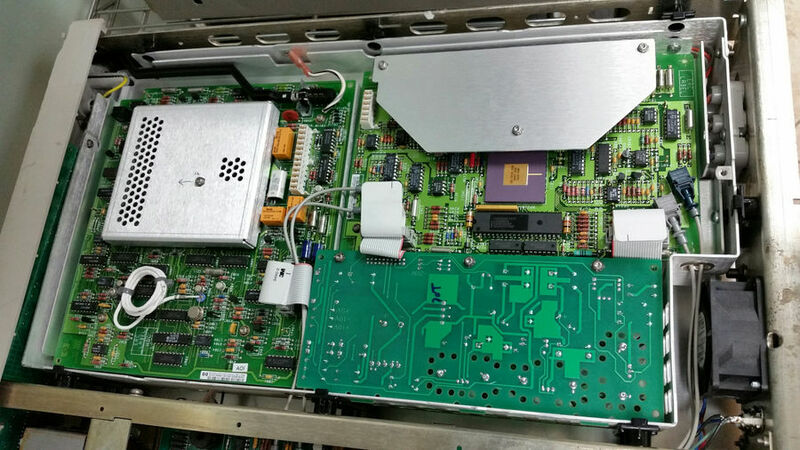 Missing GPIB connector means that there is no A5 outguard processor board. I bought one Rev.B board from another seller, and it's currently on it's way to me for initial checks and NVRAM replacements. After which it will be installed in this unit and we could test how much life left in this project. Transformer and initial power supply measurements revealed no problems there too. As some might remember, my unit N1 had blown transformer from using on 230VAC mains in 110VAC switch, which cost me 337$ for replacement. No need go this route for this unit . Per datecodes on IC's, it was made in 1999-2000 year, so it's fairly bit younger than my rusty friend. Here are few ideas I was tinkering about to try inside 3458A. Now since I'll have two units together, it's possible to perform direct comparisons between the "stock" unit and modified to see if there are any measurable gains, or it's all just waste of time. * Test various calibration things, like -10V cal, cal from 1K resistor, etc. * Try battery power for the unit, instead of mains. So the new box in case of successful repair would be used as guinea pig to try all the crazy stuff, which normal audience of these instruments would not risk to do. Before doing these modifications, I'll spend few months on running unit in stock condition, to determine correlation and performance versus my reference 3458A meter. Who does that to that kind of equipment?!?!?!? TiN with a second unit this will be interesting to follow all the experimentation and mods on this DMM. Sound like a good plan and I am exited to have anoher interesting thread to follow. how does the drift differ between a 24/7 powered against a only powered time by time. Have read many threads and available online information. My personal theory: on/off has much lower drift (physics) but may have an ref hysteresis effect. It's a crime to own 3458A and not have it measuring something. Looks like Dr. Frankenstein is just in time for Halloween! Looking forward to another one of your 3458a threads. Yes, absolutely correct - if it wouldn't be your reference and you wouldn't have another 8.5 digit precision gear like the 1281 for your daily work. Let's hope the ADC chip is OK (no drift, no convergence error). Side question to fellow Volt-Nuts. Where did you buy your 3458A? I'm not counting TiN here, because he is brave and his purchases are on the extreme side. 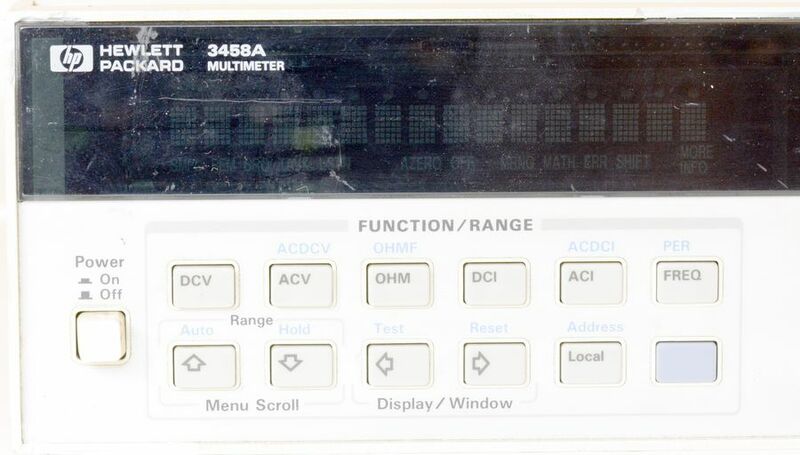 These meters show up on eBay once in a while, for rather high prices (4-6 k$) and often in a very poor condition (not as bad as TiN's, but still missing buttons, broken binding posts, sometimes with self test failures etc). I would be dead scared buying one of these, spending so much to find it has U180 problems and then either return (if possible) or spend another thousands of dollars on the missing parts and Keysight repair agreement (requires no missing parts AFAIR). In the worst case the total expense might reach levels close to a brand new unit. I bought mine from a trustable source - another volt-nuts. In the worst case the total expense might reach levels close to a brand new unit. That can happen even after 1 month of fully functional 1-year old used unit. That's why I consider for myself getting dead beaten-up unit for 1000$ is more fun than one of those nice looking ones for 3-5K$, as risk is about the same. And for me it's actually better, as it's easier to understand if whole thing is BER from the start. It's better to loose 1K than 5K. In the end chances are equal. Busted front panels, missing binding posts, keys, rusty chassis does not really matter and fixable with few hundred $$, but something like flaky U180 or missing A1 board is another game, where prices go high quick without much choices. Also logistics does matter on larger items like this one, as even just to ship unit for whatever reason to/from Taiwan costs 150-200$USD. So you want to watch out and talk with seller for everything you can, to have understanding of what you are going to pay for. My rule to treat every ebay purchased item as "Dead, full repair/diagnostics required" disregarding what item condition from seller showing saved me unthinkable amounts of money (by preventing on bidding/buying sketchy "too-good-to-be-true" stuff). I agree, and there is another danger which is one thing I can't wrap my head around - the lottery of customs getting involved and charging some arbitrary tax based on what their valuation of it may be This is despite the stuff being scrap that not only ended up being exported as e-waste and ended up smashed and bashed as landfill in a third world dump, but was eventually recovered too! Just what is going on with these "green" politicians? I'll never buy meter on eBay. The error can be intermittent, if unit pass self test on picture does not mean it will pass every-time. $2k is resonable price, but everything above is lottery. BTW if you needs 3458 service, send it to Loveland only. If not eBay then there are not so many options left. Liquidation auctions may be even worse, as you bid (and bids can go quite high + bidder premium + taxes) and cannot check anything. There might be a label attached/sticker and that's it, no returns. And the bidder is responsible for collection etc. So what's left (well except a fellow volt-nut like mentioned above) are used-line companies. I don't know how trustworthy/reliable they are. Just joking. It's boil down to how much one would like to gamble. Some people have extra 100$ to play tinkering around 20-year old ham radio, others may have 1K for rusty 3458A with missing PCBA. There are also some calibration labs and refub shops which buy these units for parts, as some of parts are not available from manufacturers anymore. These guys often the ones to fork 10-20-30K$ on stuff like faulty calibrators and high-end RF gear. Another point of reasoning these "extreme end" items for me is to produce articles on my site. I'm not great on theory or teaching to write 20-page article about the physics and math behind precision analog designs, like Shahriar could do (I always enjoy SignalPath videos, even when they are far outside of my comfortable engineering fields), so this is another way. Get something, try to fix it and hopefully learn something. This is the way I hope to get more tinkerers and lurkers to start contributing too, by providing example, that trying to do something is not that hard actually. But it does require investment of time and funds to make it all worthwhile. Of course ,there is no need to start with stuff like 3458A, I'd suggest trying waters first in something easier and cheaper, like those old Fluke/Keithley DMMs for 50-100$ flooded on ebay. Those are much simpler designs, yet still with lot of good (and not so good) design ideas to learn from. As allways one should be able to judge the risk - or stay away, based on the personal know-how and like TiN all your personal needs. my Datron 1281 is reborn out of two "for parts only" - I asked many detailed question before did the bidding. ~200 hrs fun on repair and cleaning. A very very good friend, having access to a cal lab (it's not that easy to cal like the 3458A ). And I am "in like Flinn" a fully equipped 8.5 digit DMM - "Winner, Winner, Chicken Diner". Would I do it again? Yes, at any time. Would I recommend other to do the same? If TiN would ask, probably yes. Never to any unknow to me. I guess so, it's a matter of risk and how much one can gamble. Just 3458A is quite peculiar (compared to most T&E gear I think) that the risk curve doesn't fall off with the price. TiN-like $1000 deals are rare and extreme, other meters selling for 3-5 k$ are only slightly less risky. Compare that to K2001 that I recently repaired. Got it for parts/repair for just over $200, doubled that in parts and with some help here and hours spent the meter is working. "Good" ones go on eBay for $1000-$1500 and probably for twice as much from used equipment dealers. Brand new price is $4900 (Newark for example). Maybe it is related to the fact that 3458A wasn't produced in such volumes as the other gear, so the "rarity" factor increases the price. I have had similar thougts when I caught the voltnut virus. For me it is a lot of fun but besides the money, you need a lot of time and also space which I unfortunately can not expand. This will be a nice thread to follow again. I am just a fresh owner of a 3458A, bought it on ebay and it was like new condition, even the screen protector foil was still on the display, warranty expired in mid of 2015. So, we can get lucky once in a while on ebay as well with such a high end instrument. TiN, it seems you are on a path to build the ultimate 3458A, surpassing the HFL, may be. May be one day you will start the same with a Fluke 8508A ? 8508A at 14920$? That is very unlikely, even if not considering worse ADC performance of Fluke meter. I mean Fluke is even too shy to list linearity in their specifications. There are good ideas in 8508A though, like electrically controlled rear/front terminal switching to allow ratio measurements, lower 20 and 2 Ohm ranges, reduced (?) reference temperature. But nothing we can't do with bit of help using 3458. 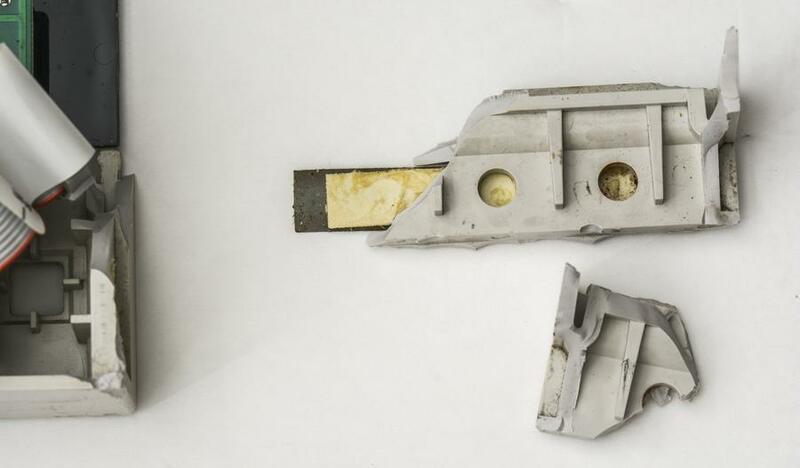 I mean if someone has it targeted for dumpster, I'd love to take one apart, as very little known about 8508A. People who have one seem to be too busy/shy to show any results, such as LTZ log or anything like it. So I still think 30-year old 3458 has the floor. even if not considering worse ADC performance of Fluke meter. I mean Fluke is even too shy to list linearity in their specifications. Even I am a proud owner of a Datron 1281 I have to agree to you. My personal judgment on the 8508A (it may fully wrong): Fluke isn't too shy, they simple don't know. 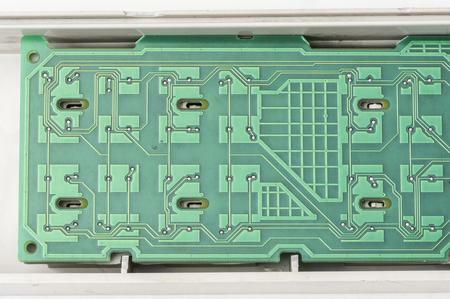 The 8508A in principle is a re-designed Datron 1281. Wavetek aquired the complete IP (as far as it may have been documented that time), but the brain's, having designed it, are gone long time ago. Then Fluke later aquired it from Wavetek - two times a break in know-how. As Wavetek stated in the 1281 manual: The instrument’s A-D converter takes the form of a highly linear, low noise, fast and flexible multislope integrator (the typical no-spec of marketing). At the specs: Excellent [meter] linearity of 0.1 ppm of full scale. But nowhere (even not in the original Datron service manual) is stated, what the ADC linearity should be (by measurment principles it must at least 1 class better to be able to guarantee. I assume its ~10 times better, thus ~0.01 ppm - this is the usual security margin in high performance measurements). If I would be a Fluke designer, having the mission to redesign the 1281 with modern components, how should I give a more crisp guarantee for that re-design, I just have schematics, some other paper, but no "sense behoyned". They only proofed method would be a "worst case error calculation by parts", I wouln't be able to do the "worst case error calculation by design" - this small but important difference makes my guaranteed specs worse. Only alternative: a complete new design based on my knowledge. I guess that's the reason, why Fluke has no own 8.5 digit DMM. The "philosophy" behind the HP 3458A is the US typical definition of useability (you don't need high educated/expensive know-how for the most common tasks == customer saves costs during use and is willing to pay higher price). Thus that "easy calibration", the most important advantage of the 3458A. I still have the impressen (I own both DMMs), the 1281 is at same level of performance, even better in drift, AC and Ohms. But nobody is able to proof that nowadays with an acceptable/realistic amount of efforts/measurements. People who have one seem to be too busy/shy to show any results, such as LTZ log or anything like it. So I still think 30-year old 3458 has the floor. 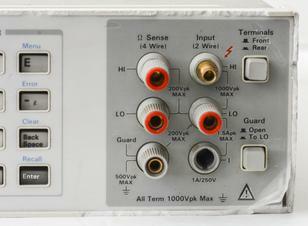 My LTZ1000A reference will go to a CAL lab next week. I will ask them to run it for 24h on a 8508A and log the data. This will also be an interesting comparison to my own 3458A. Attached is the 8508A spec sheet with extended specifications. Although the differences to the 3458A are not so big, why does the 8508A cost twice as much? There are good ideas in 8508A though, like electrically controlled rear/front terminal switching to allow ratio measurements, lower 20 and 2 Ohm ranges, reduced (?) reference temperature. But nothing we can't do with bit of help using 3458. Fun fact, 3457A has relay switched front/rear (and 30 Ohm range, but this is due to the overall ranges arrangement I suppose). 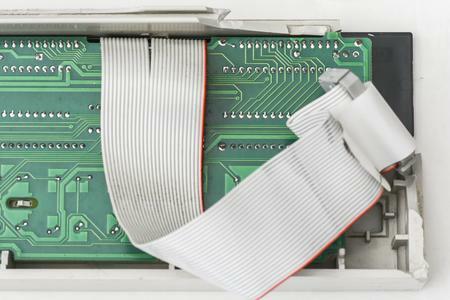 I've read somewhere that HP took some inspirations from 3457A in 3458A (binding post arrangement, a lot of keys in the front for quick function access), but somehow they didn't use relays for front/rear. I guess it's because 3457A can accept a scanner card and maybe relays were not good enough for 3458A specs (but mechanical switch is? strange). On the other hand Keithley meters accept scanner cards, but they too have mechanical front/rear switch and one has to route leads from the card to the rear banana jacks. BTW If you are planning to mod the frontend, esp. for improved resistance, here's an interesting paper attached. I don't think Fluke metrology DMM engineers don't know what it's ADC linearity. I just think it's not told to public directly, as it would not look good versus old proven 3458A. Fluke Primary standards lab have JJA unit, and I'm sure they are more than capable to perform measurements and validation of 0.1ppm-linear ADC. Publication of such data on website though is another question. There are often two ways to design things, one is just to use better and more expensive components with minor circuit modification, and other way to innovate new designs to improve performance in principle. But the later is way more involving and difficult, not just swapping obsolete BOM parts with modern replacements. Of course, these are just my own wild guesses, so take with grain of salt. Would be great to see data if they do sample run like that. At least we could estimate meter's noise and stability. If they could variate ambient temperature (e.g. 24C during working hours, 28C at night after shift), we can get even ballpark on tempco. But that's probably impossible, as I'd expect any serious calibration facility keep ambient temperature stable 24/7/365. One of the marketing benefits of 8508A is that it's modern design does not need ACAL feature to still meet the spec. Surely, the whole thing is filled with VPG foil networks and hybrids. That could also explain pricing (>16K$ new, I heard). Much less popular instrument, less volume in production -> higher pricing to keep stock and maintenance. Calibration of 8508A is another level of fun, I bet. 3458A on opposite is known proven metrology standard, with strong community of many techs and engineers knowing it's caveats and issues. So it's a go to instrument when someone needs such stability and performance. I read many research papers, DAC/ADC test reports, production test setups, and almost every single one of them uses HPAK 3458A as precision measurement box. Jeez, I sound like HPAK pays me for marketing and promotion . Maybe one A3 PCBA would be good to settle with? I have a feeling that will be needed.. I too find it surprising that with all the members here nobody has access to one laying around at work. Must be very rare instrument indeed.